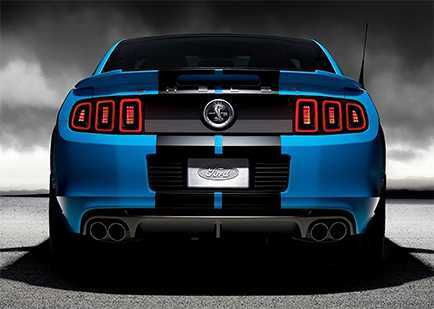 Packing all of that muscle into the Shelby's updated body results in a top speed of 202 mph. The benchmark zero-to-60 mph sprint takes just 3.5 seconds, while the quarter-mile flies by in 11.8 seconds. Don't think that the new V8 is a one-trick pony - rated at a respectable 15 mpg in the city and 24 mpg on the highway, it manages to avoid the Fuel consumption excise tax and is the most efficient engine with over 550 horsepower in North America. Unlike some its competitors, the GT500 isn't offered with an automatic gearbox. Shifting duties are handled exclusively by a tradition six-speed manual transmission, which features increased torque and rpm capacity thanks to its dual-disc clutch design. How does the GT500 manage its traction? Of course, when a vehicle sends 600 horsepower to the pavement through just two wheels, traction management becomes a serious concern, and Ford has dealt with the situation by adding more than just new gearing. A defeatable launch control system has been developed that allows drivers high levels of control, permitting specific rpm launch points to be chosen based on elevation, tire and street temperature and other variables. This system is fully unique to the SVT lineup and is incorporated into both the engine control and traction control systems. There is also a Torsen limited-slip differential that comes with the optional Performance Package, something Ford says helps even further to deliver maximum power output to the ground. Rounding out the driving dynamic upgrades are tweaks to the AdvanceTrac system, which now features appropriately adjusted steering assist levels based on the changes to the car. To bring this nearly two-ton beast to a stop, Ford installed a Brembo brake system that utilizes six-piston calipers in the front, along with larger front and rear rotors. Also part of the stopping equation are wheels and tires, to which the latest Shelby GT500 offers two sets of forged-aluminum wheels including a unique wheel for cars with the optional packages. The 19-inch front and 20-inch rear wheels are coupled with Goodyear Eagle F1 SuperCar G: 2 tires on all vehicle configurations. As with the rest of the Mustang lineup the GT500 recently gains updated HID headlights along with LED taillights, a blacked-out license-plate surround and body-colored rocker panel extensions. Unique to the GT500 are quad exhaust pipes and two new wheel designs. The interior continues to utilize a sporty dual-cowl dashboard design, vintage-inspired gauges and an oversized three-spoke steering wheel. Model-specific touches include Cobra badges, a cue ball shifter and "racing stripe" seat trim. Unfortunately, the GT500 features the same abundance of hard, dark plastics as the rest of the Mustang lineup, which feel out of place given the price tag. The GT500 is fitted as standard with leather upholstery, a leather-wrapped steering wheel with Alcantara trim, brushed aluminum interior trim, a 500-watt Shaker audio system with SiriusXM satellite radio and an AUX input jack, HID headlights and LED foglights. The available SVGT Performance Package adds a Torsen limited-slip differential, unique forged-aluminum wheels that measure 19-inches in front and 20-inches at the rear, Bilstein adjustable dampers, unique rear springs and a special instrument cluster and shift knob. Other options include a navigation system, recaro seats, heated seats and a 1,000-watt stereo system. An Electronics Package bundles the nav system with HD radio and dual-zone automatic climate control.